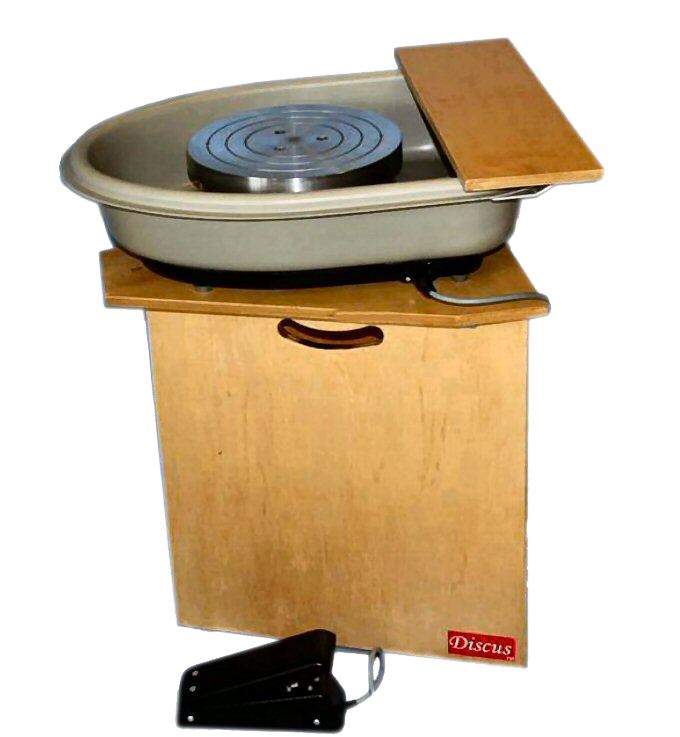 The Discus Potters Wheel is ideal for the Hobby Potter, Classrooms and Small Production run potters. Potters Wheels that are rugged, powerful and deliver constant torque so critical for clay working and often lacking in comparable products. Discus Wheels are uniquely designed with a separate motorised bowl and a electronic mains power controller enabling it to be easily lifted, moved and stored. (Bowl 6.5 Kgs, Control box 5Kgs, Pedal 500g). Easy to clean after use, the bowl can be disconnected from the control cable and moved to a sink where waste water can be tipped out and the bowl wiped clean. The intelligent electronic controller combined with a powerful constant torque 24v DC motor in the wheel itself provide the means for the Discus potters wheel to throw higher loads of clay than its horsepower or size suggests. The Craftsman model Potters wheel is capable of centring up to 16kgs (35lbs) of clay. Most importantly full torque is maintained at all speeds. During tests, the Discus proved capable of production runs of mugs, tea/coffee pot, bowls and vases in commercial quantities. The main unit weighs only 6.5Kgs.and is just 160mm high, easily carried and stored. The Craftsman motor can be reversed at the flick of a switch - a feature greatly appreciated by left-handed potters. Discus Potter's Wheels are independent and will sit securely without fixing on any work surface. When not in use, the easily managed units can be stored or stacked one on another, freeing valuable space for other tasks and projects. Just pack it away when you have finished being creative. The cast heavyweight wheelhead has two retaining screws which are easily raised with the provided Allen key and enable any of our bats to be mounted securely on the wheelhead. We supply a range of bats up to 305mm (12") to suit most needs. The main bowl is injection moulded in ABS plastic with inserts for strength and rigidity. A low power plug/socket arrangement for the motor avoids the risk of incorrect connections. The foot pedal is made from high impact plastic.The pedal is fitted with 1.5 meters of cable and provides fine adjustment to speed of rotation. Hand speed controllers are also available. Discus potters wheels are manufactured to original patented designs and will provide many years of reliable service. Components are the best of their kind available and every care and attention is taken in their assembly. 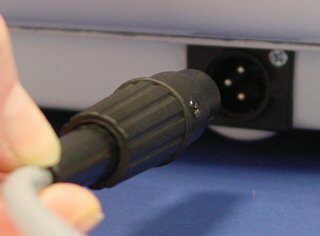 Should a component fail through normal use, we will be pleased to repair or replace it at our discretion for a period of two (2) years from the date of supply. THIS WARRANTY IS IN ADDITION TO AND DOES NOT AFFECT YOUR CONSUMER RIGHTS. YouTube videos showing the Discus pottery wheels in action. Why a Discus Potters Wheel is an excellent purchase. The Discus Potters wheel bat retaining system. Rugged powerful design of the Discus Potters Wheel and Two Year Guarantee.